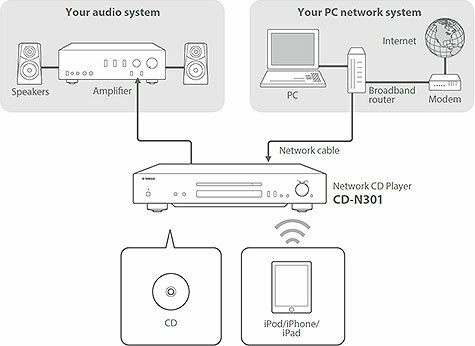 The CD-N301 is a CD player and network audio player in a single unit. In addition to your own CDs, it's simple to play audio sources downloaded from the Internet and stored on a PC or NAS system. The NP Controller app allows you to enjoy your favorite tunes on a smartphone or tablet via the network connection. Download Yamaha’s NP Controller app and use it to browse your device display to select the source or tune you want to play, as well as to see song information and album art. You can also adjust various other settings via the network. The app is compatible with both iOS (iPod, iPhone, iPad) and Android OS. The NP Controller app includes a Music Play function that lets you stream music wirelessly from a smartphone or tablet. There's no need to change to another app to enjoy music streaming, it's now quick and easy to select and hear the music stored on your samartphone via your audio system. The CD-N301 has a DC-out connection for the optional YWA-10 WiFi Adapter. This lets you stream music wirelessly via a router from network components such as a PC or NAS. The YWA-10 gets its power from the CD-N301’s USB terminal on rear panel, and offers WPS (auto setup) or manual setup via PC. The CD-N301 beautifully reproduces all sources as they were meant to be heard, and has a design sense based on the Yamaha Hi Fi concept. The aluminum front panel with its simple yet high-quality hairline finish features a top-grade design with a rotary encoder that’s convenient for network audio control. Perfectly matching other Yamaha Hi Fi components, the CD-N301 ensures a high level of owner satisfaction. regarded for audio use. A Pure Direct mode can be selected for even higher quality audio output.